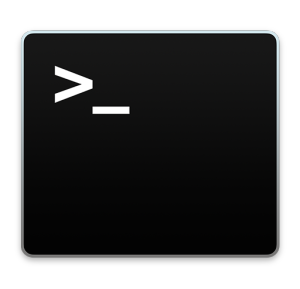 Mac users who are dealing with particularly complex or troublesome issues with Mac OS can turn to an advanced diagnostics tool available from the command line in Mac OS X. 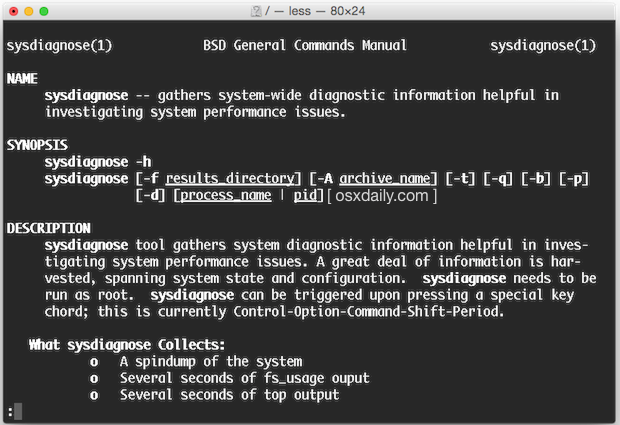 The tool, called sysdiagnose, offers detailed technical analysis and reports of a huge variety of components of OS X and the Mac hardware, making it a potentially valuable tool for advanced troubleshooting and diagnostics needs. sysdiagnose will collect a huge amount of information and data from the Mac, including a spindump and crash report, output of fs_usage and top, kernel extensions and kernel data, memory usage information and details about user processes, all system logs and kernel logs, a report from System Profiler, disk usage details and information, I/O kit details, network status and details, and additional process specific details if a process ID (PID) is specified with the command. Does that sound complicated? Well, it is intentionally so, and it’s overkill for most users, which is why this is intended for advanced users only. Frankly, the details offered by sysdiagnose will read like total gibberish to an average Mac user, and though there’s no harm in novices running the command, reading the data is going to look like geek greek. Due to the complicated technical nature of sysdiagnose reports, average Mac users will likely not benefit from it much, and thus it’s really best reserved for advanced Mac users who understand how to turn the detailed system analysis and reports into action. Once the command is run it will take a minute or two to complete data gathering, when finished sys diagnose will report the output file is available at the specified path. The file generated is usually about 5MB to 15MB, and is a tar gzip called “sysdiagnose_(date_).tar.gz”. Extracting the tar ball will reveal many files containing system reports, a system_profiler dump, and the output gathered from tons of different terminal commands, ranging from kextstat, to iotop and fs_usage, to vm_stat, and many others. Generally speaking, the contents of these files and the output of the huge variety of reports are not particularly user friendly, extraordinarily detailed in a technical manner, and therefore completely overboard for most Mac user diagnostics needs. The technical nature of sysdiagnose output puts this very much in the realm of advanced users who are adept at reading complex diagnostics data and crash reports. Those interested can gain additional details about sysdiagnose from the man page with man sysdiagnose, and you can always learn about the individual commands that are run by the tool too. Remember that advanced problems with MacOS and Mac OS X and Macs are often best handled by certified professionals. Apple has excellent customer support via phone, in store with the Genius Bar, and the AppleCare extended warranty coverage is intended to handle nearly all problems that are encountered by most Mac owners, making the official support channels appropriate for most needs. Is the output produced by this tool comparable to that of “Consultant’s canary” (as the latter seems to be no longer available)? Similar yes but even more detailed, and more spread out across many files. Consultants Canary was excellent! No, you probably won’t find anything – Mavericks is a slow bloated beast. It’s a slow bloated beast for you. It works fine for me and millions of others out there. I have also noticed that OS X has become very bloated since OS X 10.7 Lion. Mavericks is slightly better, but the bloatedness can still be seen in Yosemite. OS X needs a good tuneup, Apple needs to move to a tick-tock schedule, where every other release does NOT add any new features, and rather is a performance tweak. OS X needs to be slimmed down and the bloated beast needs to be tamed! Are you using a rotating drive or an SSD? If you’re using old legacy drives, upgrade to an SSD, it is the best possible thing you can do to improve performance. apple there any url to input the report ?